The Old Man on His Back Prairie and Heritage Conservation Area (OMB) continues to be one of the Nature Conservancy of Canada's (NCC's) flagship projects in Saskatchewan. It is a beacon of hope for protecting our remaining intact native grasslands. Located in southwestern Saskatchewan, the area features vast natural lands with significant cultural and historical value. Thanks to Peter and Sharon Butala, the ranch's previous owners, this 13,088-acre (5,297-hectare) ranch will be protected for the long term. Since 1995, NCC's Saskatchewan Region has conserved this prairie grassland ranch, leasing areas and fields for sustainable cattle grazing and managing genetically pure plains bison. 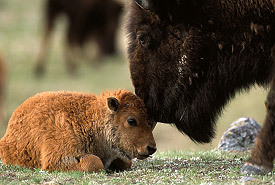 In 2003, NCC introduced a herd of genetically pure plains bison to OMB. NCC manages the property as a working ranch and showcases the positive relationship between agricultural land use and land conservation. Nestled in natural darkness from sunset to sunrise, OMB was designated a Nocturnal Preserve by the Royal Astronomical Society of Canada in 2015. This designation makes OMB the Nature Conservancy of Canada's first nocturnal preserve in all of Canada. This property attracts both novice and seasoned stargazers and naturalists who visit the ranch to experience the vast natural prairie and dark night skies. Throughout 2016, NCC celebrated 20 years of grassland conservation on this flagship property. OMB is a tribute to long-term land stewardship and a great source of NCC pride. Every year, visitors to OMB can also view the plains bison, learn of Saskatchewan's early settlers and view a host of wildlife that live on and love this land. 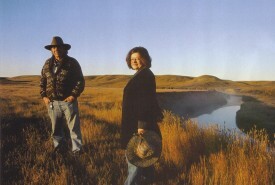 In centuries past, herds of bison roamed free here, pursued by ancestors of the Nikaneet Cree. Medicine wheels and teepee rings are testaments to previous human presence. At one time, the Northwest Mounted Police pastured their horses on part of the property. Old Man on His Back provides habitat for a variety of plants and animals. Wheat grasses, blue grama and June grass dominate the uplands. Imperiled species, such as ferruginous hawk and swift fox, frequent the property. Pronghorn, mule and white-tailed deer are also commonly sighted here. In the summer of 2011, a burrowing owl den was spotted here for the first time in eight years. Old Man on His Back is part of the semi-arid mixed-grass prairie area. It is an excellent example of our remaining mixed prairie grassland, which originally spanned two provinces and five states and more than 160 million acres (65 million hectares). Most of the mixed-grass prairie disappeared quickly with settlement and conversion to croplands. Today, about 30 per cent remains near Cypress Hills and along the Frenchman River Valley. 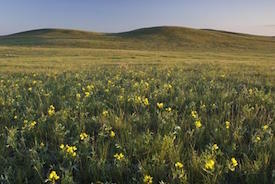 Dry prairie landscape is under great threat of cultivation in southwestern Saskatchewan. Fortunately, this property is surrounded on three sides by federally and provincially owned community pasture, forming a large block of intact native prairie. Listen to our podcast and transport yourself to this important natural area. Learn about NCC’s conservation work here. An interpretative centre on the property helps NCC share this rich natural and cultural heritage. The centre also promotes residents' and visitors' awareness and value of this area. Visitors can enjoy a rare opportunity to see the prairie in its ageless beauty, complete with a conservation herd of plains bison. The centre tells the story of the land, people and wildlife on the Northern Great Plains of southwest Saskatchewan. The interpretive centre is open weekends from mid-May to the end of September. For information on hours of operation, local travel conditions or to arrange a visit during the week, contact NCC at 1-306-296-2077 or our interpreter, Alan Dumontel, at 1-306-662-7809. 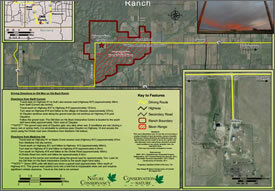 The Nature Conservancy of Canada conserved the Old Man on His Back Prairie and Heritage Conservation Area in partnership with Peter and Sharon Butala, the Saskatchewan Ministry of Environment and Ministry of Agriculture. Additional conservation partnerships are helping restore cultivated lands back to native grasses in this area.